General Motors Company was organized on September 16, 1908 incorporating the Buick Motor Company. Oldsmobile becomes the second company to join General Motors when Olds Motor Works is sold to GM on Nov. 12, 1908. Fisher Body Company was incorporated on July 22, 1908, by Albert, Fred and Charles Fisher and located in Detroit. General Motors purchased Cadillac for $5.5 million on July 29, 1909. Henry M. Leland and his son, Wilfred, are invited to continue operating Cadillac. They do so until 1917, when they leave to form Lincoln Motor Co.
On October 13, 1916, General Motors Corporation was incorporated under Delaware law and acquired all stock of General Motors Company. 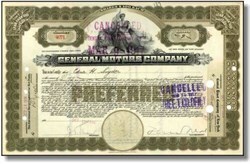 Consequently, the General Motors Company stock was retired which makes this certificate very desirable. General Motors (NYSE: GM), the world's largest vehicle manufacturer, designs, builds and markets cars and trucks worldwide, and has been the global automotive sales leader since 1931. GM employs about 355,000 people around the world. In 2001, GM set industry sales records in the United States - its largest market - for total trucks and for sport utility vehicles. GM sold more than 1 million SUVs - a first for any automaker. GM also sold more full-size pickup trucks than any other manufacturer since 1978. GM operates one of the world's largest and most successful financial services companies, GMAC, which offers automotive, mortgage and business financing and insurance services to customers worldwide. Founded in 1908, GM today has manufacturing operations in more than 30 countries and its vehicles are sold in about 200 countries. In 2001, GM sold more than 8.5 million cars and trucks - more than any other automaker and 15.1 percent of the global vehicle market. GM has four major regional markets: North America, Europe, Asia-Pacific, and Latin America, Africa and Middle East. GM cars and trucks are sold under the following brands: Chevrolet, Pontiac, Buick, Oldsmobile, Cadillac, GMC, Saturn, Hummer, Saab, Opel, Vauxhall and Holden. GM parts and accessories are marketed under the GM, GM Goodwrench and ACDelco brands through GM Service and Parts Operations. GM's OnStar subsidiary is the industry leader in in-vehicle safety, security and information services. It provides more than 2 million subscribers with a variety of services, including automatic notification of air-bag deployment, stolen vehicle location, remote door unlocking, emergency services dispatch, roadside aid, remote diagnostics, route support, and concierge services. OnStar Personal Calling allows drivers to make and receive hands-free, voice-activated, cellular phone calls through a nationwide network. Virtual Advisor gives subscribers access to personalized information in a hands-free, voice-activated manner without screens or displays. OnStar is or will soon be available in most GM vehicles and on select Acura, Audi, Isuzu, Lexus, Subaru and Volkswagen vehicles. GM's other major subsidiaries are Hughes Electronics Corp., GM Locomotive Group and Allison Transmission Division. As part of its global growth strategy, the GM Group includes alliances with Fiat Auto SpA, Fuji Heavy Industries Ltd., Isuzu Motors Ltd. and Suzuki Motor Corp. GM also has strong technology collaborations with Toyota Motor Corp. and Honda Motor Co., and vehicle manufacturing ventures with Toyota and Renault SA.